Added on June 12, 2017 by Spencer Wright. These parts were printed by my friends at Playground Global on their 3D Systems DMP320 in titanium 6/4. Like the titanium parts I've had printed (and written about extensively) in the past, these are done via laser metal powder bed fusion - the generic name that often gets referred to as "DMLS". These parts were, of course, designed in nTopology Element Pro; you can see more of my design process here. As loyal readers will know, I've put a lot of time into using Abaqus to predict these parts' mechanical properties; more on that in the near future. For the time being, the goal with this print was to test the manufacturing process - and use any lessons here to guide future design iterations. As you'd imagine, there's a *lot* that goes into printing a part that has ~45,000 beams; establishing manufacturing parameters was a good way to filter out nonviable design strategies. It'll take a bit more work to characterize the as-built design fully, but at first inspection it seems to have been a total success. I was careful to keep most of the beams' orientations at a high angles, thicknesses above .45 mm, and lengths below 3 mm; the result is a structure that's almost completely self supporting. At this point, the part has been roughly cleaned up and bead blasted to remove any surface discoloration. The next step is to tap the holes, clean up the clamp surfaces, and mock the entire assembly up. 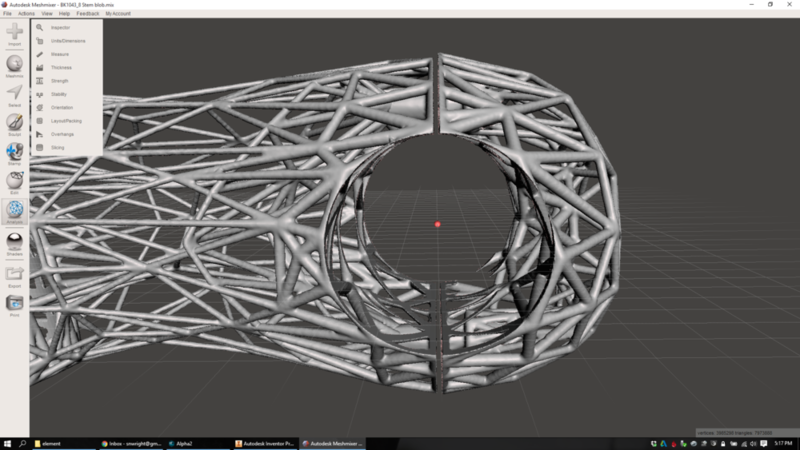 See also: DMLS lattice sample prints, where I describe the part's design a bit more. Added on March 10, 2017 by Spencer Wright. There have been a bunch of big updates to Element recently, and this workflow takes advantage of a few of them. 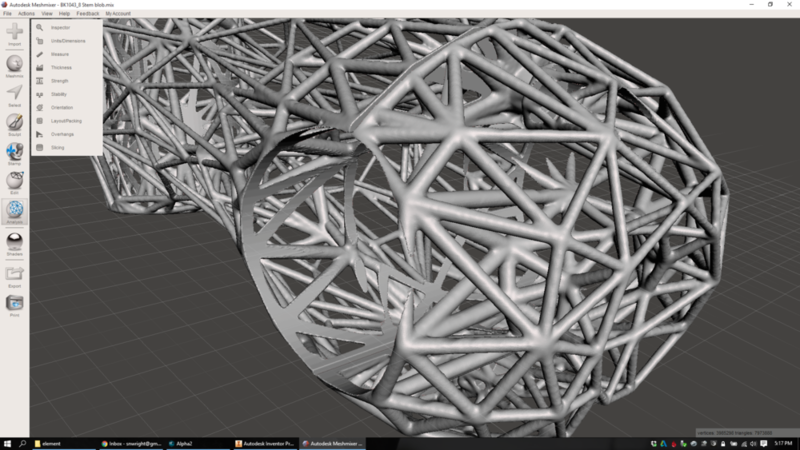 In particular, the new Warp to Shape tool is very helpful; I also used the Extract tool and the Remesher to make some nice selective surface lattices. Added on January 5, 2017 by Spencer Wright. The bottom of the stem faceplate sample shows the smooth finish where the part was wire EDM'd off of the build plate. These parts were printed in titanium 6/4 by C&A Tool in Churubusco, Indiana; they were designed in nTopology Element. This is a pure lattice structure - the entire geometry is designed as beams and nodes, with no explicitly defined solid regions. The beam lengths are on the order of 2-3 mm; their thicknesses range between .45 mm and 1.1 mm. In some areas (for instance, the bolt holes) this results in a fully solid part, but the transition from lattice to solid is continuous rather than discrete. The result is a structure that's solid where it needs to be and sparse elsewhere, with no stress risers where solid and lattice meet. The parts are, of course, sample regions of the bike stem that I've been working on for some time now. The intent of the samples was to prove the printability of the structure and identify any potential difficulties. The results were overwhelmingly positive: With the exception of a few small flaws, the parts printed very well, and I believe the problematic areas can be addressed in the design pretty easily. Thanks to Rich Stephenson for his ongoing help on this project - and for continuing to educate me on the metal AM industry. Added on August 9, 2016 by Spencer Wright. 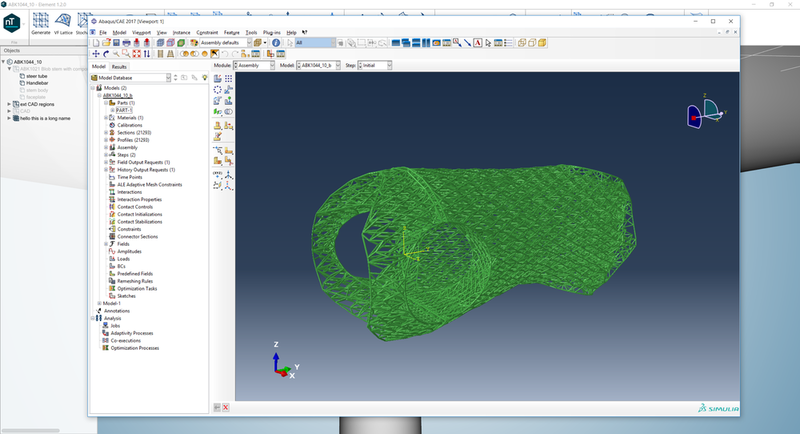 This week I got some good news: Researchers at The MTC had begun printing one of my latticed bike stems. The first 14mm of my latticed bike stem, printed in titanium on an Arcam A2x. The part is upside down (relative to the build orientation) in this photo. This part was printed in titanium 6/4 on an Arcam A2X. Unfortunately the build failed at 14mm high; on the upside, it appears that the failure was *not* caused by my part. It's a bit early to make any judgments about its feasibility, but I'm pleased to see that these beam diameters (which are between .8mm and 1.8mm) seem to print without support structures. As you can see below, many of them (almost all, in fact) had very low angles relative to the XY plane. The build orientation of my latticed bike stem. I'm hoping to have more progress on this soon. Thanks to my friends at The MTC for their help with printing - and with debugging the design! Added on June 18, 2016 by Spencer Wright. The lattices here were, obviously, designed in nTopology Element Free (which is free!). I happen to have done the mechanical design in Inventor, but the rendering was done in Fusion 360 (effectively free, and totally capable of doing the mechanical design as well). 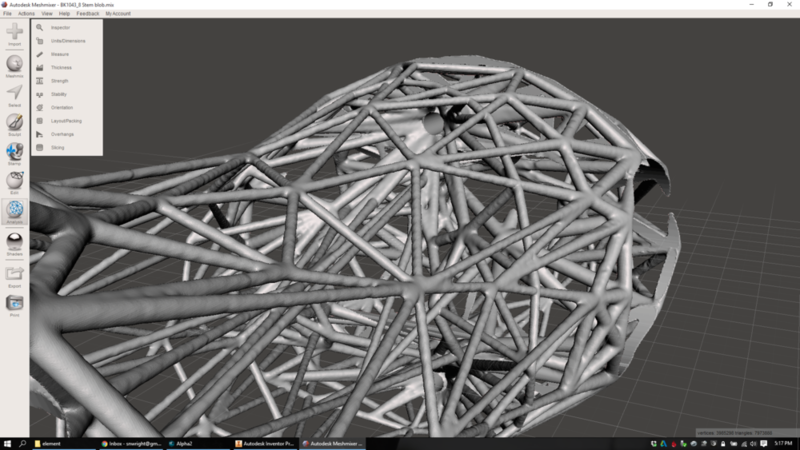 I separated face groups and remeshed surfaces in MeshMixer (free! 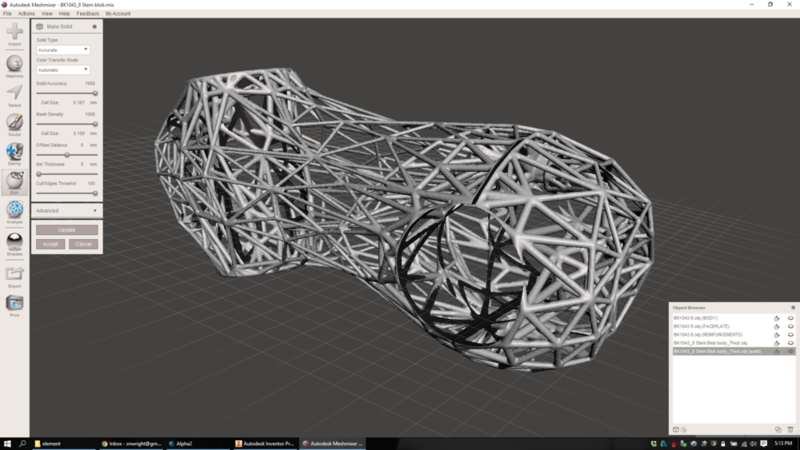 ), and very well could have done the booleans there too (I used netfabb). ^ I just think that's a bit remarkable. Anyway, it's ready. Printed part (DMLS titanium) soon. Added on May 16, 2016 by Spencer Wright. Yesterday I recorded a quick demo of myself using nTopology Element Free, which shows how *shockingly* easy the software is to use :) Check it out! Added on April 19, 2016 by Spencer Wright. When I joined nTopology, our flagship CAD software - Element - was in closed beta. I had used it myself over the fall, and was impressed at how quick and easy it was to generate variable lattice structures. But the GUI was often confusing and many of the core functions were still very much prototypes. Today, I'm proud to announce that nTopology has released its first public product - Element Free. We've spent a ton of time on this over the past four months, and have both streamlined the workflow and improved the core design tools needed to design and edit complex lattice structures. We'll be working hard to integrate more features into Element Free over the coming months - and will be releasing a Pro version this summer. Head over to the nTopology Product page to download the software yourself! Added on March 25, 2016 by Spencer Wright. Just a quick update to yesterday's post - here are some screenshots showing a little bit of how I'm controlling thickness on my lattice stem. Our variable thickening algorithm allows the user to input minimum and maximum beam diameters. If a beam isn't within the range of any point modifiers, then it's thickened to the minimum value. If it's within range, then its thickness is determined by the falloff curve of the modifier that it's within range of. If it's within range of multiple point modifiers, then the greater thickness value is used. As you can see above, the Modifier Editor allows the user to preview the effect that the modifiers will have on a part; blue means that a region is not within range of a modifier (and will be the minimum thickness), and red means that it's within range (and the maximum thickness will be applied). We allow you to preview this on any mesh in your project. Here I'm looking at a variably thickened lattice, but generally I'd start with a uniform thickness lattice and then play around from there. The big change in the design yesterday was adding point modifiers in four locations: On either side of the handle bar clamp, and on the top and bottom of the steerer clamp. These modifiers have steep cosine falloff curves, meaning that they have a big effect on a relatively small region of the part. I've controlled the range and falloff so that just the beams on the edges of those surfaces are affected. I also have point modifiers at all of the bolt holes, and a few that control thickness on the rest of the clamp surfaces, and then two point modifiers that make the transition from the clamp surfaces to the center of the extension a bit more gradual. We've been thinking a bit more about how to develop modifiers in the future - stay tuned! Added on March 24, 2016 by Spencer Wright. A friend asked me yesterday what was going on with my lattice bike stem design, and after telling him that it's been on the back burner I played with it a bit and made some real (if subtle) improvements. Bolt holes. These need to be maximum thickness (1.5mm) to accept threads and distribute the load from the bolts. Clamp surfaces. Where the stem clamps to the steer tube and handlebar, the part needs to have relatively high surface area. All lattice beams should lay on the surface itself, and thickness should be high as well. Mechanical stress. I haven't done a full analysis of this part, but in general stress will be concentrated near the clamp surfaces and will be lower in the middle of the part. Added on January 3, 2016 by Spencer Wright. Nine months ago I had one of those random conversations where you walk away feeling thrilled to be working in an industry with such compelling, intelligent people. I had met Bradley before then (there are only so many people working on additive manufacturing in NYC), but only in passing. In the meantime our paths had diverged somewhat. He was working hard on design software, whereas I had focused on getting industrial AM experience through developing a physical product. But our approaches to the industry had converged, and we had developed a shared enthusiasm for addressing the technological problems in AM head on. We became instant allies, and started swapping emails on a weekly basis. In August, when nTopology launched their private beta program, I jumped at the chance to use it in my own designs. The engineering advantages of lattice structures were immediately evident, and nTopology's rule-based approach allowed me to quickly develop designs that met my functional goals. And as I spent more time with nTopology's software - and got to know Greg, Matt, Erik, and Abhi - my enthusiasm about what they were building only grew. Today I'm thrilled to announce that I'm joining nTopology full time, to run business operations and help direct product strategy. nTopology's team, mission, and product are all precisely what I've been looking for since I began working on additive manufacturing, and I can't wait for the work we've got ahead of us. From the very beginning of my work in AM, it was evident that traditional CAD software would never let me design the kinds of parts I wanted. I was looking for variable density parts with targeted, anisotropic mechanical properties - things that feature-based CAD is fundamentally incapable of making. 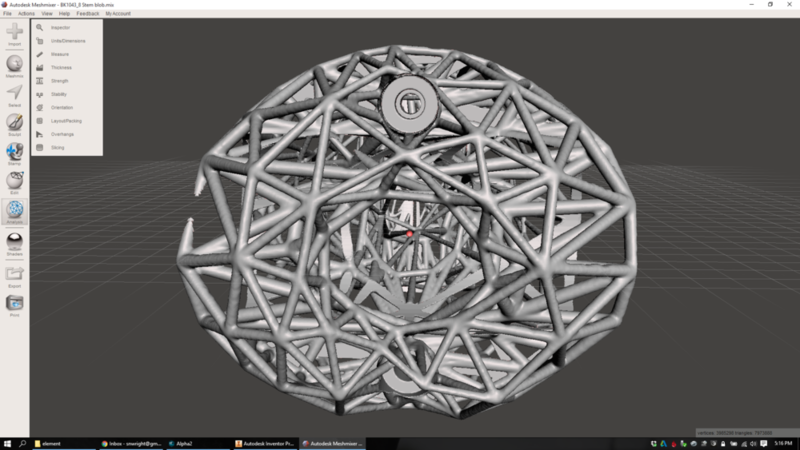 nTopology's lattice design software, on the other hand, can. As the number of beams in a lattice structure increases beyond a handful, designing by engineering intuition alone becomes totally impractical. It's important, then, to run mechanical simulations early on, and use the results to drive the design directly. nTopology let me do just that. nTopology's approach towards optimization lets me, the engineer, set my own balance between manual and algorithmic design. This is key: when I intuitively know what the design should look like, I can take the reins. When I'd rather let simulation data drive, that's fine too. The engineering process is collaborative - the software is there to help, but gets out of the way when I need it to. 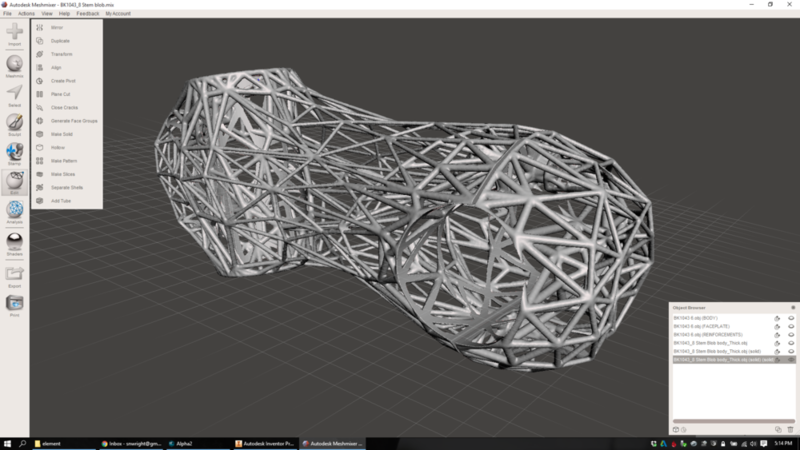 Best of all, nTopology doesn't limit me to design optimization - it lets me design new structures and forms as well. That means far more flexibility for me. No longer am I locked into design decisions artificially early in my workflow, when a lot of the effects of those decisions are unknown. nTopology gives a fluid transition from mechanical CAD to DFM, and lets me truly consider - and adjust - my design's effectiveness and efficiency throughout the process. The nTopology team has shown incredible progress in a tiny amount of time. They've built a powerful, valuable, and intuitive engineering tool in less than a year - and have set a trajectory that points towards a paradigm shift in additive manufacturing design. In the coming months, I'll be writing more about our company, our mission, and our design workflow. If you're an engineer, developer, or UI designer interested in working on the future of CAD, send me a note or see our job postings on AngelList. To learn more about purchasing a license of nTopology Element, get in touch with me directly here. Added on December 11, 2015 by Spencer Wright. The photos in this tweet have been public for over a year now. I've been aware of the project since last June; it was created by Arup, the fascinating global design firm (whose ownership structure is similarly fascinating). They needed a more efficient way to design and manufacture a whole series of nodes for a tensile structure, and for a variety of reasons (including, if I recall correctly, the fact that each node was both unique and difficult to manufacture conventionally) they decided to try out additive manufacturing. As it happens, I was lucky enough to speak to the designer (Salomé Galjaard) by phone a few months ago, and enjoyed hearing about the way they're thinking of applying AM to large construction projects. In short: I'm a fan of the project, and love to see it get more exposure. There's something about the particular wording of Jo Liss's tweet, though, that is strange to me. Specifically, I find myself asking whether a computer did, indeed, design the new nodes. As far as I can tell, Arup's process worked like so: Engineers modeled a design space, defined boundary conditions at the attachment points (which were predefined), and applied a number of loading conditions to the part. Here the story gets less clear; some reports mention topology optimization, and others say that Arup worked with Within (which is *not* topology optimization). My suspicion is that they used something like solidThinking Inspire to create a design concept, and then modeled the final part manually in SolidWorks or similar. Regardless, we can be nearly sure that the model that was printed was indeed designed by a human; that is, the actual shapes and curves we see in the part on the right were explicitly defined by an actual engineer, NOT by a piece of software. This is because nearly every engineered component in AEC needs to be documented using traditional CAD techniques, and neither Within nor solidThinking (nor most of the design optimization industry) supports CAD export. As a result, most parts that could be said to be "designed by a computer" are really merely sketched by a computer, while the actual design & documentation is done by a human. This may seem like a small quibble, but it's far from trivial. Optimization (whether shape, topology, or parametric) software is expensive, and as a result most of the applications where it's being adopted involve expensive end products: airplanes, bridges, hip implants, and the like. Not coincidentally, those products tend to have stringent performance requirements - which themselves are often highly regulated. Regulation means documentation, and regulating bodies tend not to be (for totally legitimate reasons which are a bit beyond the scope of this blog post) particularly impressed with some computer generated concept model in STL or OBJ format. They want real CAD data, annotated by the designer and signed off by a string of his or her colleagues. And we simply haven't even started to figure out how to get a computer to do any of that stuff. I'm reminded here also of something that I've spent a bunch of time considering over the past six months. The name "CAD" (for Computer Aided Design) implies that SolidWorks and Inventor and Siemens NX are actively helping humans design stuff. To me, this means making actual design decisions, like where to put a particular feature or what size and shape an object should be. But the vast majority of the time that isn't the case at all. Instead, traditional CAD packages are concerned primarily with helping engineers to document the decisions that they've already made. The implications of this are huge. Traditional CAD never had to find ways for the user to communicate design intent; they only needed to make it easy for me to, for instance, create a form that transitions seamlessly from one size and shape to another. For decades, that's been totally fine: the manufacturing methods that we had were primarily feature based, and the range of features that we've been good at making (by milling, turning, grinding, welding, etc) are very similar to the range of features that CAD packages were capable of documenting. But additive manufacturing doesn't operate in terms of features. It deals with mass, and that mass is deposited layer by layer (with the exception of technologies like directed energy deposition, which is different in some ways but still not at all feature based). As a result, it becomes increasingly advantageous to work directly from design intent, and to optimize the design not feature by feature but instead holistically. One major philosophical underpinning of most optimization software (like both Within and solidThinking Inspire) is that the process of optimizing mass distribution to meet some set of design intentions (namely mechanical strength and mass, though longtime readers of this blog will know that I feel that manufacturability, aesthetics, and supply chain complexity must be considered in this calculation as well) is a task better suited to software than to humans. To that effect, they are squarely opposed to the history of Computer Aided Documentation. They want CAD software to be making actual design decisions, presumably with the input and guidance of the engineer. First, we need user interfaces that allow engineers to effectively communicate design intent. Traditional CAD packages never needed this, and optimization software has only just begun the task of rethinking how engineers tell their computers what kind of decisions they need them to make. Second, we need to expand the number of variables we're optimizing for. Ultimately I believe this means iteratively focusing on one or two variables at a time, as the curse of dimensionality will make high dimensional optimization impractical for the foreseeable future. It's because of this that I'm bullish on parametric lattice optimization (and nTopology), which optimizes strength and weight on lattice structures that are (given input from the engineer) inherently manufacturable and structurally efficient. Third, we need a new paradigm for documentation. This is for a few reasons. To start, the kinds of freeform & lattice structures that additive manufacturing can produce don't lend themselves to traditional three view 2D drawings. But in addition, there's a growing desire  within engineering organizations to unify the design and documentation processes in some way - to make the model itself into a repository for its own design documentation. Thanks to Steve Taub and MH McQuiston for helping to crystalize some of the ideas in this post. After publishing this post, I got into two interesting twitter conversations about it - one with Ryan Schmidt, and the other with Kevin Quigley. Both of them know a lot about these subjects; I recommend checking the threads out. Added on October 24, 2015 by Spencer Wright. This is still not manufacturable, and is still missing all the mechanical features too. But it's getting there! By combining a skin lattice (which my part definitely needs in at least some regions, for instance the clamp faces) and a minimal, bonelike volume lattice, I hope to be able to create something that's significantly lighter than a comparable tube-to-tube (e.g. welded) structure. The next step, I think, is to reintroduce the mechanical features (at least some of them) into the model *before* I remesh the surfaces. I would really want the mesh density to be created relative to the kinds and intensities of the forces that the part is going to be under: for instance, all of the bolts and clamp faces will want higher density meshes around them, etc. At the moment my best bet is to do that manually, by selecting areas I want to be at higher densities and just remeshing them to suit my intuition.